Now people and parliament is finally waking up to the total dog’s dinner Brexit is, it’s more important than ever to march for the public to have a final say over our future. Brexit’s biggest chance of succeeding was always to bore the population into submission, and let them tell themselves that it couldn’t be stopped, that resistance was useless. 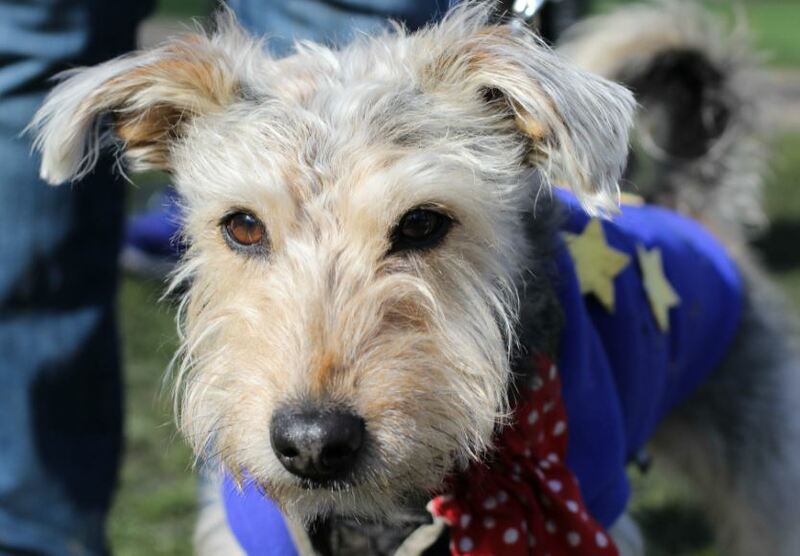 That’s why in October 2017, myself and a few friends first started taking photos of dogs posing with ‘#Wooferendum – Stop Brexit’ signs, printing them out and sticking them up in public places. And our dogged determination made headlines around the world. Dog owners started posting their own photos on social media. 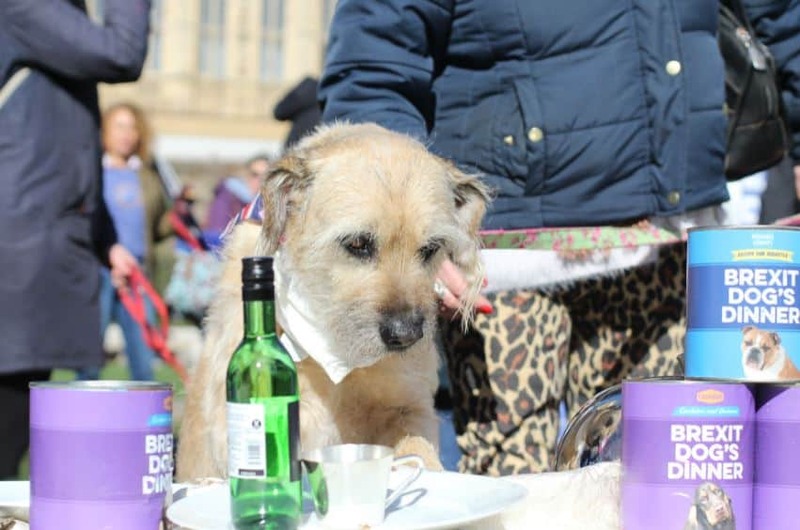 In parks and at political conferences we’d hand out ‘pawlitical’ campaign ‘Wooflets’ – and watched people’s eyes light up – even thought they were reading about Brexit. 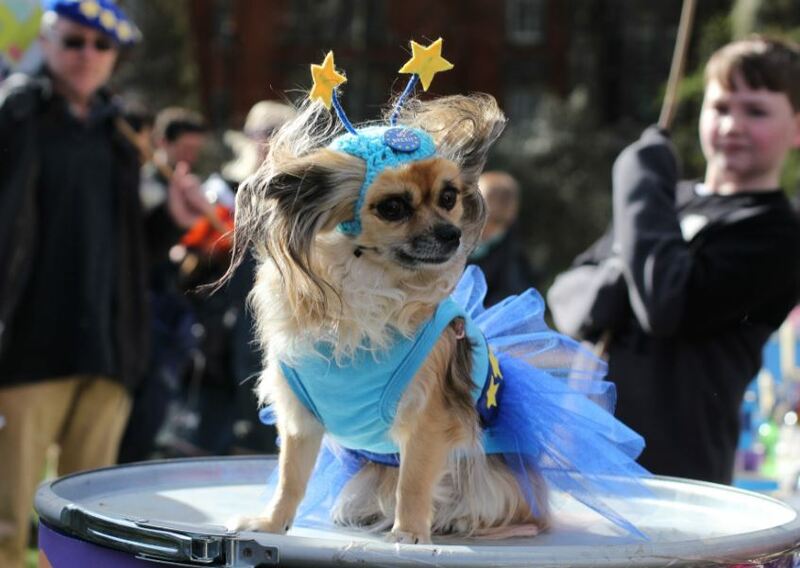 The campaign grew, we made a film and in October 2018, around three thousand people and hundreds of dogs marched through central London to Parliament, in what we called ‘the biggest bark in history.’ It was reported around the globe. 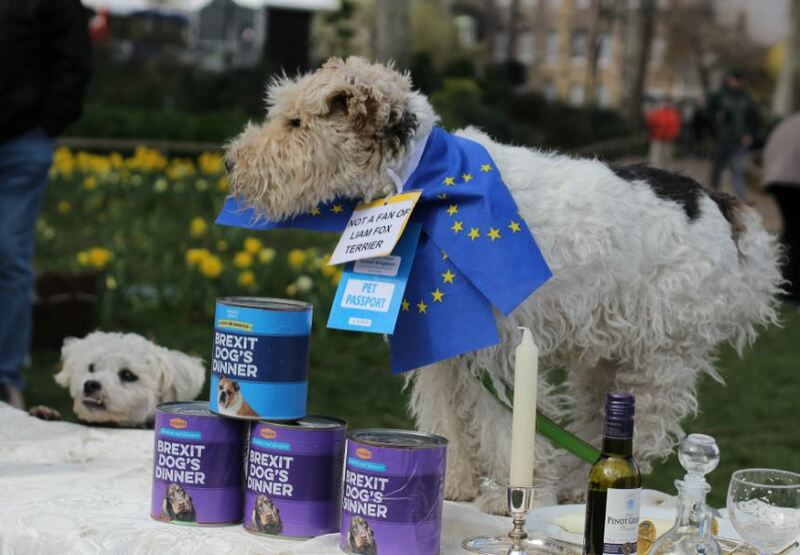 This month, the Wooferendum campaign made headlines in the UK and around the world again, as we staged a ‘Dog’s Dinner’ outside Parliament. 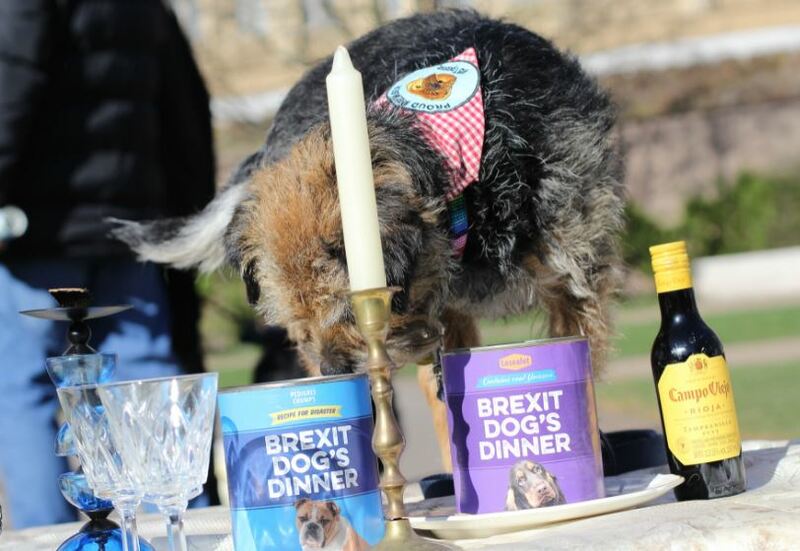 We set up tables for hungry hounds to show their disgust at the tins of Brexit Dog’s Dinner on offer to them. The dogs rejected both varieties – ‘Pedigree Chumps Recipe for Disaster’ and ‘Losealot – made with real unicorn’. Items on the menu included Mogg Roast, Porky Pies, Chloronation Chicken and Eton Mess. 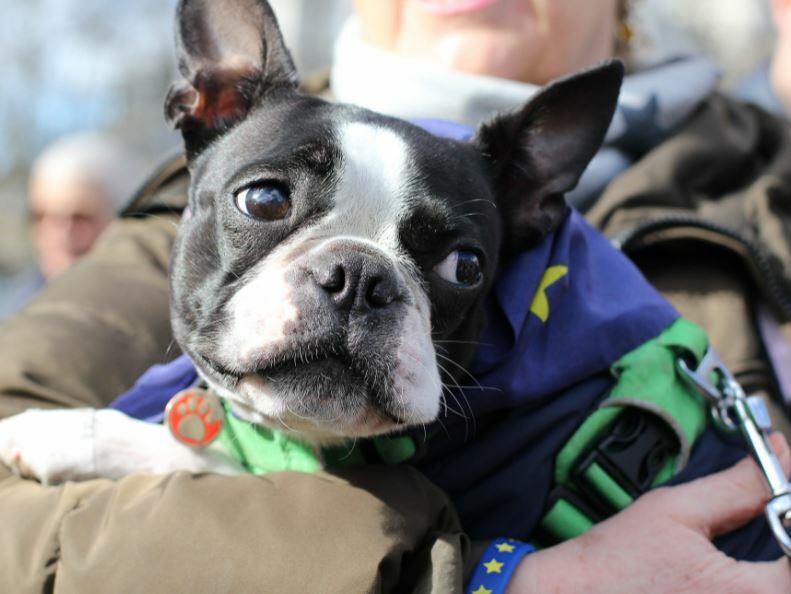 The Wooferendum campaign is one piece of a huge mosaic of campaigning and speaking out by millions of people in the UK and in Europe. People who believe that staying silent is not an option. 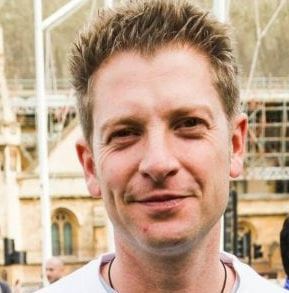 And we expect the turnout on Saturday’s People’s Vote march will include rather a few more people – and pooches – than the Brexit Betrayal March – even Nigel Farage now says he won’t be completing himself. So if you think Brexit is barking – get out and tell the government what a dog’s dinner they have made of it all.